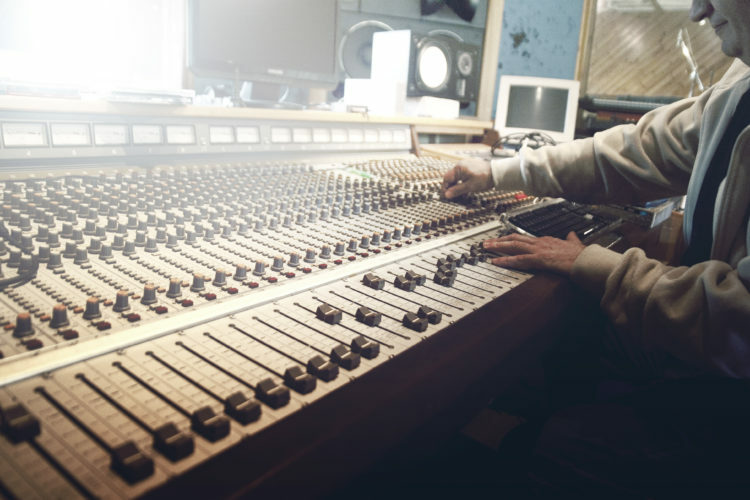 We have all seen a ton of blogs covering topics on studio acoustics, proper room treatment, choosing the right monitors, and DAW software, but one thing we tend to overlook is how healthy or ergonomic our production space is. Most project home studios usually grab any extra table they have laying around the house and then spend money on the big executive CEO chair of the starship enterprise. I personally made this mistake over 20 years ago when i first started producing music and found that by the end of my studio sessions my legs were numb, my neck was cramped and my back was always sore. When you spend hours at a time in a chair that does not properly support your back with lumbar support or you’re hunched over with your neck bent downward as you program a synth or drum machine while bobbing your head like a madman, that will start affecting your body and creative energy in a negative way. Years later, I alleviated some of these issues by investing in a proper Herman Miller office chair and buying a proper elevated studio desk with tilted keyboard stands for all my gear. 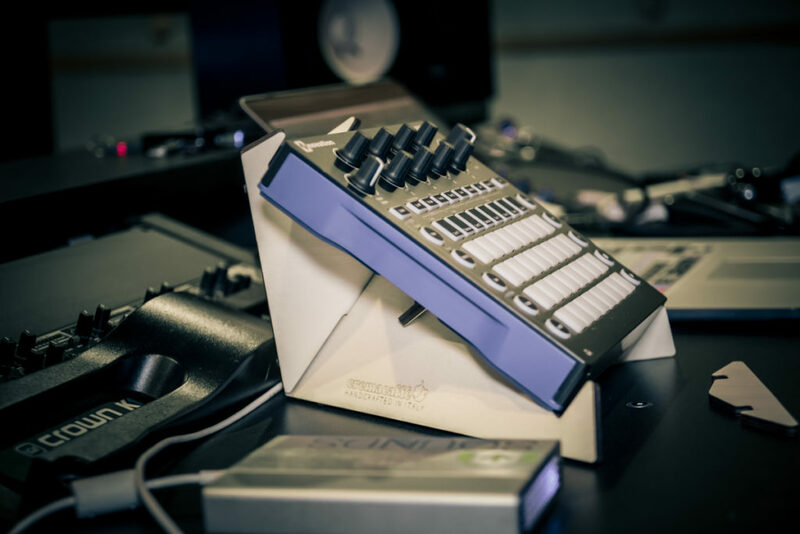 These days there are a variety of stands on the market to choose from and they all serve various needs for specific gear while catering to the workflow of musicians. The key here is getting the right stand for your workspace that is well-built, yet supports proper posture keeping you comfortable and in the end results in longer productive music sessions. I just recently purchased two new Cremacaffè stands (Spike & Kosmo) for a lot of my smaller drum machines and micro synthesizers. The big reason I went with these stands was the ability to change the tilting angles since they are built out of wood. You’d think they would be heavy but they are super light, do not require tools to be assembled, and they break down completely flat, which for me is awesome as i have to travel a lot. 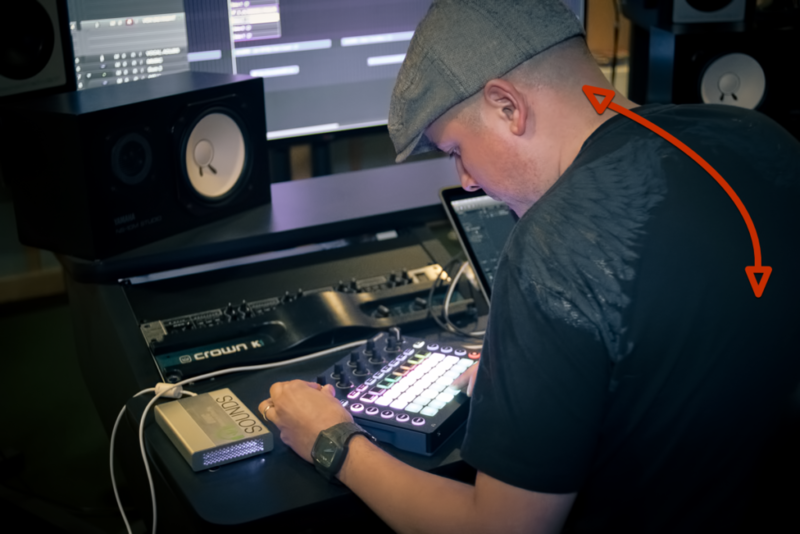 Having your gear properly elevated not only will help your neck and back from feeling like an 80 year-old but it also helps your wrists and music programming. This is especially true for live performers and finger drummers. Elevating your laptop is also an important key, whether your DJ’ing or in a studio environment where a laptop is your main computer. In this image above, I have the Cremacaffè Kosmo stand elevating my 15’ Macbook Pro while the Spike stand holds my Novation Circuit. This setup helps keep my posture upright without the need to be hunched over causing discomfort in my neck. Having my gear elevated at an angle helps me view knobs and button commands much easier. In this scenario I’m reducing the amount of all the up / down side to side head movements between looking at my Macbook screen & the Novation Circuit. While a simple stand may not seem that important it really does help speed up productivity when your comfortable and able to navigate between multiple devices with a simple glance. So the next time you spend a few hours working with table top devices on a flat desk, instead of reaching for a bottle of Advil try looking for a proper stand that will elevate your gear a bit and reduce the fatigue on your neck, wrists and back. Splice offers unlimited backups, version control, and a whole community of producers sharing their work for free. 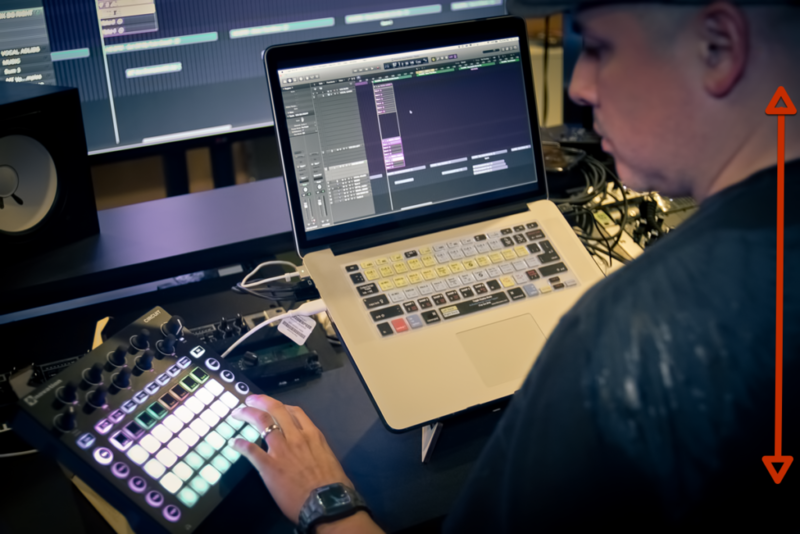 We support Logic X, Garageband, FL Studio and Ableton Live. To get started, sign up here!